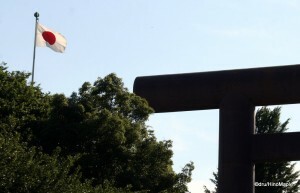 Large torii and the Japanese flag at the approach to Yasukuni Shrine. Yasukuni Shrine is the most controversial shrine in all of Japan. It was prominently in the news when former Prime Minister Junichiro Koizumi was in power. During his entire time in power, he visited Yasukuni Shrine 6 times which caused relations between Japan and China and South Korea to grow very tense. He was seen by many in Japan to be honouring the war dead and promoting peace. From China and South Korea, he was seen to be honouring war criminals and thumbing his nose at both China and South Korea. Yasukuni itself has tried to shy away from such controversies by claiming to be a religious place with no ties to political activities. Yasukuni Shrine is a religious area and it can hard to imagine why it is such a polarizing place if you don’t know the history of the shrine. Ultimately due to the separation of state and religion in Japan, the government has no official power as to how Yasukuni is operated, but it is also a troubling problem for Prime Ministers looking to pray for peace within Japan. It is a very tough problem for Japan but one that many foreigners seem to not fully understand. Omura Masujiro from the approach to Yasukuni Shrine. Yasukuni itself is located north of the Imperial Palace. The closest stations to Yasukuni are Iidabashi Station and Kudanshita Station. There are many other ways to reach Yasukuni Shrine but these are the closest and easiest methods. If there is time, I prefer to go through the Kitamaru area of the Imperial Palace due to the beautiful park in the Kitamaru area. The best way to enter Yasukuni Shrine is from the eastern corner of the shrine grounds. 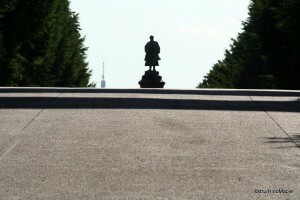 There is a long broad approach that is lined with trees and a statue of Omura Masujiro located at the top the approach. Omura Masujiro was the principle figure who modernized Japan’s military from the samurai system into what we know of today. The approach continues until you reach the main area of the shrine itself. The approach is one of the most popular places to visit as it is lined with many trees that are extremely beautiful during the cherry blossom season and in the autumn season when the leaves change colours. While the approach is one of the most beautiful approaches in Tokyo, the shrine left a little to desire in my own eyes. 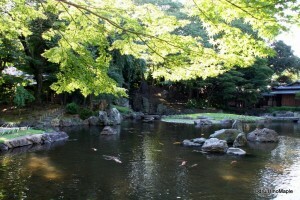 The only interesting aspects of the shrine itself are the intricate details within the main area of the shrine and the pond behind the shrine. Looking around the shrine grounds you can see various symbols of Japan, specifically the chrysanthemum shield and the rising sun motif. When Japan was at war, the main flag was the sun burst design which became known as the “rising sun flag”. It was used mostly for military ships and contained the typical Japanese flag with red rays coming from the central red disc. This is still a controversial design and never flown in Japan aside from the ultra-right wing conservative groups. The closest design to this is the naval flag which uses the same design but offsets the sun to the left. You can see this rising sun imagery around Yasukuni Shrine as it is a war memorial shrine. Yasukuni Shrine is a shrine that is dedicated to the war dead. All of the people who fought for the Emperor of Japan are written down in a registrar and the registrar is enshrined within the shrine itself. Anyone who is an enemy of the Emperor, including many of those who fought for the Tokugawa Shogunate, the de facto head of Japan during the Edo Period when the Emperor had little to no power, are not allowed to be enshrined at Yasukuni Shrine. Enemies of the Emperor and most foreigners fighting for the Japanese military are often enshrined within the Chinreisha, a small separate shrine located adjacent to Yasukuni Shrine. It is so small that you can easily miss it. The controversy of Yasukuni Shrine comes from the names in the registrar that are enshrined. Since Yasukuni enshrines those who fought for and died for the Emperor, it also includes the names of several war criminals. 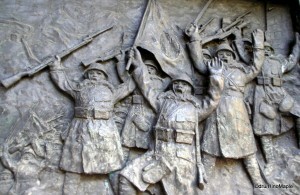 During World War II, several Japanese military men committed war crimes against people in China and South Korea. Because they were fighting for the Emperor at the time, they were granted the status of being enshrined within the registrar of Yasukuni Shrine. Registration into the registrar is supposed to be a completely independent process that the shrine does on its own. The enshrinement of people into the registrar of Yasukuni Shrine should be done without the explicit influence of the government. Some people do argue that Yasukuni Shrine was influenced by right wing supporters to enshrine some of the war criminals rather than placing them into the Chinreisha. Any evidence that the government or the right wing supporters had of their influence is probably gone and few people are talking about that now. Either way, Yasukuni Shrine made the decision to enshrine some of these war criminals as they technically fought for the Emperor. Whether this is the correct thing to do, politically or otherwise, is beyond our control now. What was done is done and the main problem is that it is nearly impossible to move such “deities” from a shrine after they have been officially enshrined. One of the reasons the Chinese and South Koreans are upset over this is due to the fact that within Shintoism, once a person is enshrined, they are forgiven for their misdeeds. In other words, the war criminals were forgiven in the afterlife and allowed to rest in peace. On a sadder note, Yasukuni Shrine also enshrines thousands of Korean and Chinese soldiers. These men and sometimes women were enlisted into the Japanese army and possibly forced into battle against their own people. Many people within their families objected to the family member being included into the registrar and some have tried hard to get their relatives out of the registrar as well. The only problem with this is that within the Shinto religion, it is generally impossible for an enshrined deity to be un-enshrined. They are eternally enshrined in whichever shrine they have been enshrined within. This is a big problem with Yasukuni as it is very difficult for any of the people within the shrine’s registrar to be removed or even moved. I have often though that the easiest part is to just move the enshrined war criminals into a new shrine, even one that is just adjacent to the main shrine, specifically Chinreisha. Perhaps moving all of the Chinese and Korean listed people into a completely new shrine would be more satisfactory. It is a very sensitive subject and Yasukuni, mainly due to the enshrinement of the war criminals, has created a spark point in Japan’s relations with its neighbours. 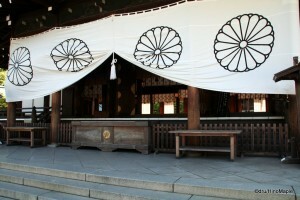 When we look at the strict meaning of Yasukuni itself, it appears to have the image of being peaceful. Yasukuni should be a peace shrine where all those who died in war are enshrined, save for the war criminals. It is hard to contemplate and understand enshrinement as it is akin to become a demi-god. The fact these people are promoted to demi-god status is where many foreigners get upset and angry. When you look at it from the other side of the coin as a place where you look at the loss of life and also as a type of peace memorial, you realize the double meaning of this shrine and things are no longer black and white. I am not a priest and I have no authority over Yasukuni Shrine itself. It is still a lovely shrine to visit and one of the more important shrines in Tokyo. It is not my favourite shrine in Tokyo as that would go to Meiji Jingu or one of the countless smaller shrines that dot Tokyo. There are far better places to go around Tokyo than Yasukuni. Due to its controversial history, it took me a very long time to decide to visit it. I almost didn’t visit Yasukuni due to its controversial past. It is something I don’t regret having put off and I’m happy to have visited the shrine. It is just not something that I find particularly interesting and it is not a place that I would pray to. Everyone should have the right to pray and have their own beliefs. Whether you agree with their religion or not, it is a personal choice. Hopefully the world can grow up and respect other religions both for their positive points, and their negative points, and learn to move on. It is not just a one way street either and I think Yasukuni Shrine could do more to help others or to educate people in better ways rather than keeping a tight lid on what happens. This entry was posted in Tokyo and tagged China, Chinreisha, deity, Emperor, Emperor of Japan, god, Hinomaru, Idabashi Station, Iidabashi Station, Imperial Palace, japan, Junichiro Koizumi, Kitamaru, Korea, Kudanshita, Kudanshita Station, military, Omura Masujiro, rising sun, Shinto, shrine, South Korea, tokyo, war, war criminal, war dead, World War II, WWII, Yasukuni, Yasukuni Shrine by Dru. Bookmark the permalink.